Hello! 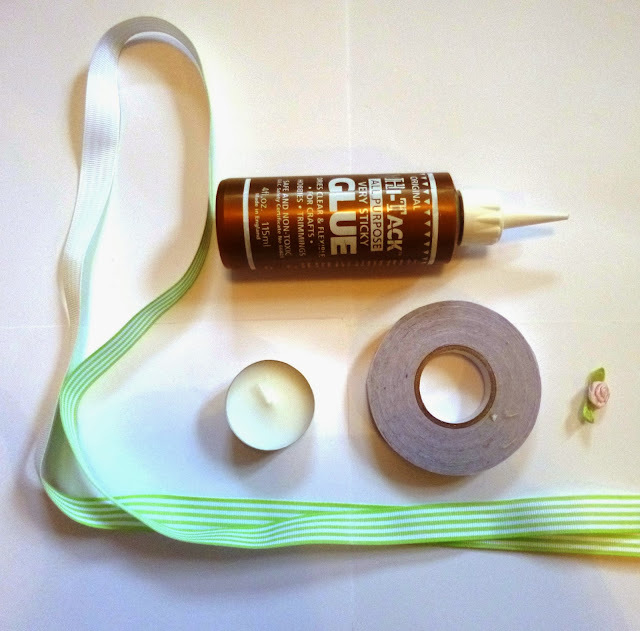 My name is Rachel,and I blog over at Crafts from a Ravenclaw,and Thank You very much Katie for allowing me to blog over here at Running with a Glue Gun today! I have these decorated tealights to show you, and they make great last minute gifts, just in time for the holiday season. Also the colours and decorations are completely customisable,so you each one can be completely individual! Decoration such as gems, bows etc. Step 1: Check that your ribbon is not taller than your tealight, as this could potentially be a fire hazard. Optional: Decorate your tealights further using small embellishments, but keep in mind the potential hazard of lots of loose fabric. I hope you liked it,and thanks again Katie for having me. *This is such a cute idea, especially with the holidays coming up. I think a bunch of these in red and green would be so pretty. Thanks Rachel for the guest post!